Some fear a setback for the technology after a pedestrian was killed Sunday night in a crash involving a self-driving Uber SUV in the U.S., the first death involving a fully autonomous test vehicle. Uber immediately suspended all road-testing of such autos in the Phoenix area, Pittsburgh, San Francisco and Toronto. The ride-sharing company has been testing self-driving vehicles for months as it competes with other technology companies and automakers like Ford and General Motors. Philippe Klein, the chief planning officer at Nissan, said the automaker is ensuring its tests are safe. He said specially trained drivers keep their hands on the wheel on such vehicles, prepared to "take over the car" to ensure the "highest possible safety" in its tests. The Uber crash is still under investigation. Toyota Motor Corp., which is working with Uber on driverless systems, said in a statement earlier this week it has halted automated-driving tests in the U.S. because of the possible "emotional effect on its test drivers." Toyota said it did not know the specifics of the accident or its causes. Honda Motor Co. has declined comment on the accident but said it was not changing its work on developing self-driving technology. Tokyo-based Honda's autonomous drive technology differs from that used by Uber. Nissan has been conducting autonomous driving tests in London, Tokyo and California. 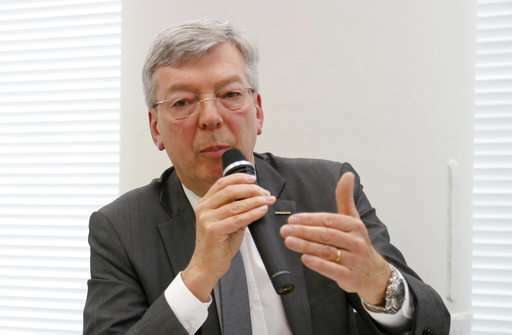 The company, which has an alliance with Renault SA of France and Mitsubishi Motors Corp. of Japan, has been aggressive in pursuing the technology. 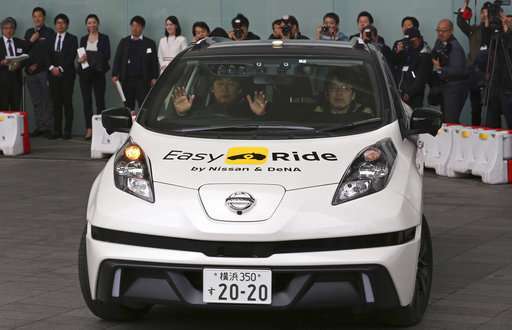 Nissan said Friday that it plans to equip 20 models in 20 markets with autonomous driving technology by fiscal 2022, one of the pillars of a strategy launched last year. Driverless cars are still not allowed on public roads in Japan, although its major automakers are all working on the technology. Vehicles now sold commercially will stop on their own before a crash or automatically remain inside lanes during highway driving, but drivers must be present and keep their hands on the wheel. Nissan—which makes the best-selling EV the Leaf, the March subcompact and Infiniti luxury models—said Friday it aims to sell 1 million electrified vehicles a year by fiscal 2022. Electrified vehicles refer to both pure electric vehicles, hybrid vehicles that have both an electric motor and a gasoline engine and other green vehicles like plug-ins. Klein declined to give a breakdown of the electrified models planned but he said that fuel cells, which run on hydrogen fuel, were too costly to be practical anytime soon.